Sometimes we will have to face one of the biggest problems with the whole Sharepoint 2010 suite; that is basically the Office 2010 integration. These days Microsoft are working really hard to be sure they can get a perfect integration between both products, going to the extreme with the two suites, but what Microsoft can't do for us is the full Office / Sharepoint integration, just because if we are looking for some special requeriments we will need to customize both products. For this task we will need to have an approach in one "new" technology which was introduced in Office 2007. This is based in customize Office 2010 Ribbons and Backstage views. Both sets are the most powerful weapon that office 2010 has for developers, as we can do anything we want with them. We can even rebrand our Microsoft Word. Microsoft Office Fluent user interface (UI) replaces the current system of layered menus, toolbars, and task panes with a simpler system that is optimized for efficiency and discoverability. The Ribbon, context (right-click) menus, the Quick Access Toolbar, and the Microsoft Office checkbox are all parts of the Office Fluent interface. There are a number of custom and built-in controls, such as buttons, checkboxes, and combo boxes, that you can add to the Ribbon. 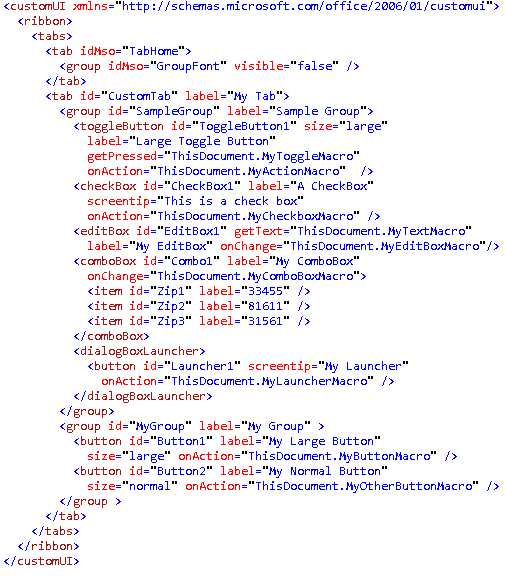 You add components to the Ribbon with XML markup elements, and set properties on those components by using attributes. In Microsoft Office 2010, the Office button is replaced by a File tab. Clicking the File tab takes you to the Microsoft Office Backstage view. Backstage view helps you discover and use the features that fall outside the authoring features on the Ribbon. Ribbon, Mini toolbar and galleries all help you work in your documents; Backstage view helps you work with your documents. Backstage view is fully extensible by developers, permitting organizations to customize the user interface (UI) to suit their own needs. And best of all, the Backstage UI is customizable by using the same files, callbacks, and many of the controls used in the Ribbon. This means that developers already familiar with customizing the Ribbon UI can use those same skills to create a Backstage UI targeted at the needs of their organization. In the next chapter we will go deep inside in the Backstage View development. This new tool will provide to Office and Sharepoint an endless scability.